Thought to gently calm our hearts and minds - and help us cast our worries aside - this enchanting crystal suggests you may find yourself feeling slightly self-conscious around the people you know this week. Harmless comments from friends, colleagues and family members may leave you feeling slightly paranoid, and you could find yourself feeling very emotional too. Calm your beautiful mind by holding a Blue Lace Agate by your heart. Known as a stone of eternal love and domestic bliss, this stunning crystal suggests you may find yourself falling into an old - and unhealthy - habit this week. Late night calls to ex-partners - and momentary lapses in judgement - may leave you feeling very regretful, and you may need to reach out to a friend or loved one for their help and support too. Wash away your worries and sadness by keeping an Emerald in your home, or holding one by your heart. Symbolising love, inner-peace and healing, this mesmerising crystal was highly prized by the ancient Greeks - who lovingly nicknamed the gem ‘Inca rose’. Thought to help us love ourselves and the people around us unconditionally, it suggests you may find yourself feeling very touched by a friend or loved one’s kindness this week. Nurture the bond between you by placing a Rhodochrosite beside a photo of you together, or sending them one as a gift. Known as a ‘worry stone’, this beautiful crystal suggests you may find yourself overthinking everything about everyone this week. Distracted behaviour from friends and loved ones may leave you feeling slightly rejected, and you could find yourself feeling very guilty about something from the past too. Wave your worries goodbye - and keep your spirits high - by placing a Jasper under your pillow each night, or simply keeping one with you every day. Bewitching the hearts of everyone - from jewellers and healers, to artists and designers - this stunning crystal is thought to gently nurture the child within. Symbolising happiness and fun, it suggests you may find yourself feeling very uplifted by a friend, colleague or loved one’s positive energy this week. Fun gatherings with friends and family members may leave you feeling really happy, and you could find yourself attracting a new admirer too! Known as a stone of new beginnings and change, this spellbinding crystal symbolises the start of a new - and truly wonderful - time in your life. Pregnancies, births and wedding proposals are all likely, and you could find yourself feeling very maternal towards someone around you too. Celebrate all the love and happiness around you - and keep it coming to you! 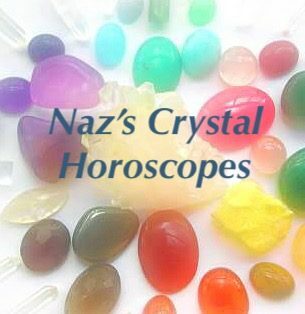 -by keeping a Moonstone in your bedroom, or placing one by a window in your home or work place. This beautiful crystal is thought to help with everything - from attracting love and healing your heart, to calming your mind and enhancing your beauty. Synonymous with self-love and healing, it suggests you may find yourself longing to be closer to someone around you this week. Happy memories from childhood - and vivid dreams about days gone by - may leave you feeling very nostalgic, and there could be an instant connection between you and a new person around you too. Known as a stone of happiness and abundance, this mesmerising crystal suggests there could be an exciting career opportunity for you this week. Chance encounters with like-minded souls - and unexpected work offers - could leave you feeling very inspired, and you may find yourself feeling very positive about the future too. Maximise your confidence - and give Lady Luck a helping hand - by keeping a Citrine in your purse or wallet, or placing one beside some money. Thought to lovingly nurture our bonds with others, this beautiful crystal suggests you may find yourself feeling slightly broody this week. Heartwarming conversations with friends, colleagues and loved ones may leave you feeling slightly emotional, and love could blossom between you and a friend - or two people around you too! Nurture your mind, body and soul by placing a Unakite under your pillow each night, or simply keeping one with you each day. Synonymous with the sea and water, this captivating crystal suggests you may find yourself feeling more emotional than an Adele album this week. Challenging conversations with friends, partners and family members may leave you feeling very drained, and you may need to make a very big decision about your future too. Leave the past behind you - and embrace all the love and happiness in front of you - by placing an Aquamarine in your home, or simply keeping one with you each day.